Take a unique and special journey through the history and joy of making chocolate. A 25 minute film explains in detail the story of chocolate and how the cocoa beans are grown and harvested. The film shows the journey of the cocoa beans from country of origin to the factory and the process the cocoa beans go through to create modern chocolate. Visitors are given a demonstration on how both chocolates and Easter eggs are made. They are shown the machinery needed to make chocolate. The “hands on” session involves visitors putting on aprons, coating chocolates, adding toppings and hand piping with white chocolate. All participants get to decorate and package their own chocolate to take home. Fun for both children and adults. Booking essential. 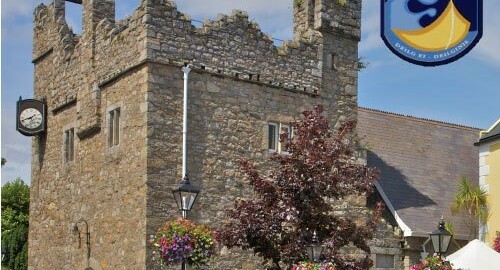 Dalkey Castle is one of the seven fortified town houses/castles of Dalkey. The castles were built to store goods off-loaded in Dalkey during the Middle Ages, when Dalkey acted as the port for Dublin. From the mid-1300s to the late 1500s, large Anglo-Norman ships could not access Dublin, as the river Liffey was silted up. But they could anchor safely in the deep waters of Dalkey Sound. The castles all had defensive features to protect goods from being plundered. These are all still visible on the site. On site you will find a medieval castle/fortified townhouse, an early Christian Church, a state of the art Heritage Centre, and a Writers’ Gallery with portraits and interactive screens featuring the work of 45 writers and creative artists. Climb to the battlements for panoramic views of sea and mountains. Enjoy the peace and tranquillity of the early Christian Church and Graveyard, dedicated to Saint Begnet. Browse the interactive time line from early Christian through Viking, Medieval, Victorian and modern times. Guided living history tours – Professional actors bring history to life with a fun theatre performance as part of the guided tour. Travel back in time and be enthralled by the work of the Archer, the Cook and the travelling Barber-Surgeon. Actors from Deilg Inis Living History Theatre Company involve you in their lives, their work and their stories. It is wise to book the tour in advance online (Adults €9.95; concessions). Entry to the Heritage Centre is included in the guided tour price. See the Centre’s website for details of other events such as guided literary walks and low season offerings. Castle Street, Dalkey, Co. Dublin. Ireland’s most popular family attraction (over one million visitors a year). Opened in 1831, Dublin Zoo is one of the world’s oldest and most popular zoos. It has been transformed in recent decades into a 28 hectare park of gardens, lakes and natural habitats for over 400 animals. Many are rare species and their survival in the wild is under threat; many of the zoo’s animals are part of international breeding programmes for endangered species. The African Plains area is spectacular, a facsimile of the grassy savanna and open plains of the natural wild. See giraffe and zebras wander while the hunting dogs prowl. Look out too for the rhino, the ostrich and the chimpanzees. Kids rate this venue a 5-star experience. Open Mon–Sun. Jan: 9.30 am–4.30 pm; Feb: 9.30 am–5.00 pm; Mar – Sept: 9.30 am–6.00 pm; Oct: 9.30 pm–5.30 pm; Nov & Dec: 9.30 am–4.00 pm. Closed December 25 and 26. [The African Plains close thirty minutes before the listed closing times]. Adults €19.50; concessions. There is a slight discount for booking online. Dublinia is a museum in which Viking and Medieval Dublin are re-created through life-size reconstructions. Viking Dublin Exhibition: See what life was like on board a Viking warship. Learn about long and challenging voyages, weaponry and the skills of being a Viking warrior. Try on Viking clothes, become a slave and stroll down a noisy street. Visit a smoky and cramped Viking house, learn the Viking runic alphabet and hear their poetry and sagas. Medieval Dublin Exhibition: From Strongbow to the Reformation, experience the re-created sights, sounds and smells of this busy city. Learn of warfare, crime and punishment, death and disease. Visit a medieval fair, a rich merchant’s kitchen and a bustling medieval street. History Hunters Exhibition: Learn how archaeology works with history and science to piece together the jigsaws of our ancestors’ lives and lifestyles. See genuine Viking and Medieval artefacts, including those of a medieval skeleton found in Dublin (courtesy of the National Museum of Ireland). Hear the languages of old Dublin and explore the city’s earliest maps. Visit the lab and learn how bugs and dirt can be the history hunter’s gold. St Michael’s Tower: Dublinia’s late seventeenth century viewing tower belonged to the church of St Michael the Archangel, which once stood at the site now occupied by Dublinia. The medieval tower has 96 steps leading to a panoramic view of Dublin. Access to the viewing tower is weather dependent. To generate atmosphere, the walking route through Dublinia is a little narrow so the attraction is less enjoyable at peak periods (especially when large tour groups may be in attendance). For this reason, visiting the site off peak is recommended. Open Mar-Sept: 10.00 am- 6.30 pm; Oct-Feb: 10.00 am-5.30 pm. Closed 24-26 Dec.
St. Michael’s Hill, Christchurch, Dublin 8. Dunsink Observatory, opened in 1785, was the first building in Ireland specifically constructed for scientific research. Ireland’s greatest mathematician/scientist, William Rowan Hamilton, lived and worked here. Originally part of Trinity College Dublin, it was purchased by the state in 1947 when the School of Cosmic Physics was established (as part of the Dublin Institute for Advanced Studies). The Observatory is used nowadays mainly for public outreach, workshops/conferences, and as visitor accommodation. Rooms can also be hired by external parties. Open Nights are held on the 1st and 3rd Wednesdays of each month during the winter months (October-March). Weather permitting, visitors can view celestial objects through the historic Grubb Telescope. There are also audio-visual presentations, lectures on a wide variety of topics in astronomy, and question and answer sessions. Open nights are free of charge. From time to time Dunsink Observatory holds a special evening for parents and children who would like to meet a real astronomer and explore the night sky together. This family event begins at 7.30 pm with a short presentation, followed by live stargazing (weather permitting) and a question and answer session. School/College trips to Dunsink Observatory can be arranged if booked beforehand. These trips can be organised for day or evening time. For general queries, phone 01 4406656.